I’ve written before about the power of literate programming, using to create reports when code runs. It’s fairly simple to combine this with the graphical drawing packages to create impressive graphs and figures on the fly. A lot of academics I’ve spoken to have shied away from using for drawing, despite being very proficient with the textual layout. Similarly, a lot of students on the OU Mathematics degree write up all of their assignments in but drop in hand drawn graphs and diagrams. Just like anything else in , once you get your head around how it works, it’s actually not that difficult to create very complex structures. One of the best tools I’ve discovered recently is ShareLatex.com, the equivalent of jsfiddle – very easy for playing around with diagrams and seeing what effect changes will have without having to recompile whole documents and also very easy to share with colleagues when you need a hand. You need to register to use it and you can create pdf versions easily – fantastic when you don’t have everything you need installed locally but need an updated figure straight away. If you’re using then bookmark that site! If you don’t have a copy of the Graphics Companion1, which explains everything in detail, like any other programming language, the resources are all available online if you know where to look. However, I’ll start with a quick example of a few images2 and then you can search for the rest :). Right now, I can imagine that everyone doing the modelling exercise for this year’s MST210 is hoping that I’ll use that problem as an example. Sorry to disappoint but I won’t do your work for you. However, all the methods you’ll need are in this post. Let’s look at exercise 29 from unit 33. Neither the question nor the answer to this problem has a diagram, and since I’m not going to solve the problem here (the answer is in the book!4) it’s a nice example. 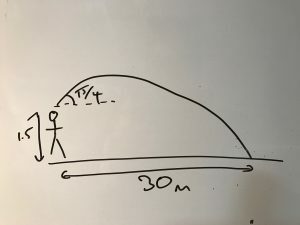 A stone is thrown from a height of 1.5m above horizontal ground at and angle of above the horizontal and lands at a distance of 30m from the point it was thrown. Estimate the speed with which it was thrown. Starting point, basic axis (click on the image for an enlarged version to see the code. Let’s add a horizontal line and the angle. 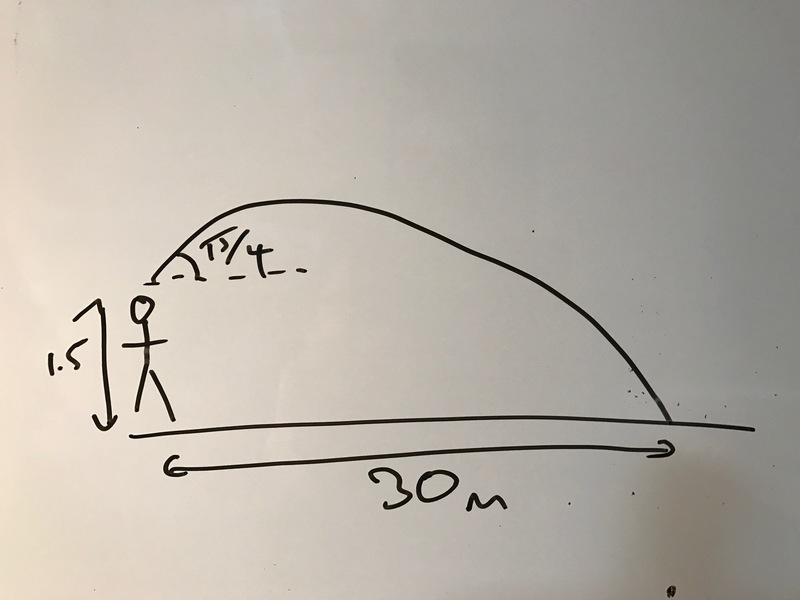 A short dashed line parallel to the x-axis can be defined, but we don’t want it full length so let’s make it length 1.5 so it sits neatly below our initial velocity line. 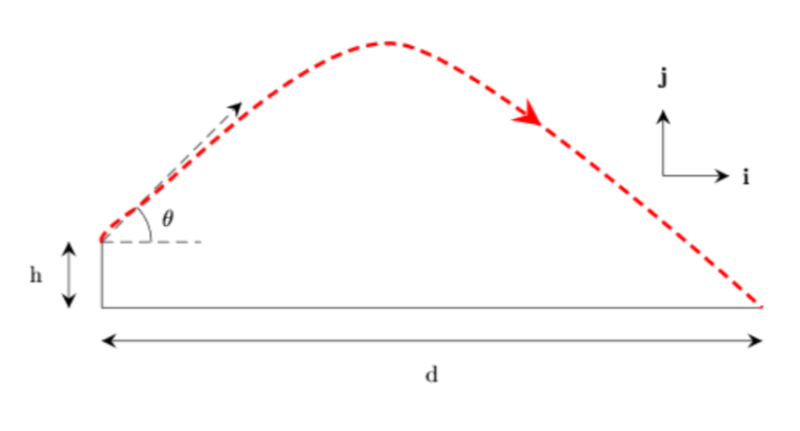 Now, we want to draw an arc from this new line to show using \draw arc. An arc needs a starting point, the angles that contain the arc, and a radius. Since we’re starting from the horizontal this is nice and easy. 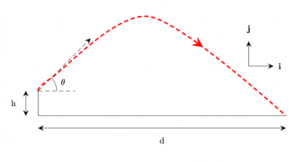 Our starting point is (0.75,1) and we want an arc from 0 to 45 degrees. Since we are parallel with the origin, our radius is simply our x coordinate again (0.75). Finally we want to label our angle so we define a node just outside of our arc and put a in it. This time, we add to the dash by making the line ultra thick and colouring it red. The plot [smooth] parameter will draw a smooth curve through the points we specify. Since we know this is a parabola, we can use A and B as our start and end coordinates5 and just before halfway there will be an apex. Since the drawing is not to scale, you might need a bit of trial and error to get the image to look right. Here I’ve used a point close to the start to ensure the trajectory stays on the 45 degree angle and then played around with the y-coordinate until I found something that worked. Finally, let’s add some labels and arrows. We can add labels using the node command as we did to label the angle. For height and distance we can add further lines offset by 0.5 from the height and distance6. We can also define some arrows to add to our lines. For this, we add a few extra options to tikz. And there’s the final diagram. If you want to grab the code for this and have a try yourself, I’ve made my ShareLatex.com project publicly visible. Once you’ve done one, you’ll see how easy it is to create your own diagrams quickly. There are a whole host of specialist packages out there depending on what sort of diagram you need to draw. Tikz has a lot of examples, or failing that try googling “latex draw [subject]”. I’d recommend the Graphics Companion as it does explain all the commands from first principles if you really want to get into the guts of it. Finally, the stackoverflow LaTex forum is a fantastic place for questions and answers. Remember that some of the commands are absolute and others reference the origin by default. With a little planning (perhaps a sketch on some graph paper) you can make life easy for yourself. Drawing diagrams can make your presentations neater and once you’ve done a few, you’ll see how easy they are.